The cruise was definitely fast-paced, with us spending less than 24 hours in some of the world’s most beautiful cities. I guess that’s one of the downfalls of doing a cruise, but one of my favourite things about doing day tours with the cruise was being able to skip the long lines. Anyway, we had a couple of days at sea before our arrival in Athens and safe to say, I was not used to being on a rocking ship. On our second day at sea, I ended up getting seasick, which was just so much fun. Apart from kneeling to the porcelain throne, I spent the majority of the day horizontal in bed. And not only that, but right after my bought of seasickness, I ended up catching a cold. Just my luck, eh? It was my first time in Greece and I was so excited to see Athens and its ruins. The Parthenon was our first stop so we could visit the Acropolis and see the amazing view of Athens. We also visited the archaeological site of Sounion where the Temple of Poseidon is located. That also had an amazing view of the sea and the drive along the coast was beautiful as well. Had we had more time, I totally would have wanted to spend some time on the beach. What a beautiful city! It was cool to see both the modern aspects of the city as well as the ancient one — definitely an interesting juxtaposition. First, we visited Topkapi Palace and saw some super beautiful crown jewels, including a huge 86-carat diamond. We walked through the Grand Bazaar, which is the place to go in Istanbul if you want jewellery or knockoff designer bags. 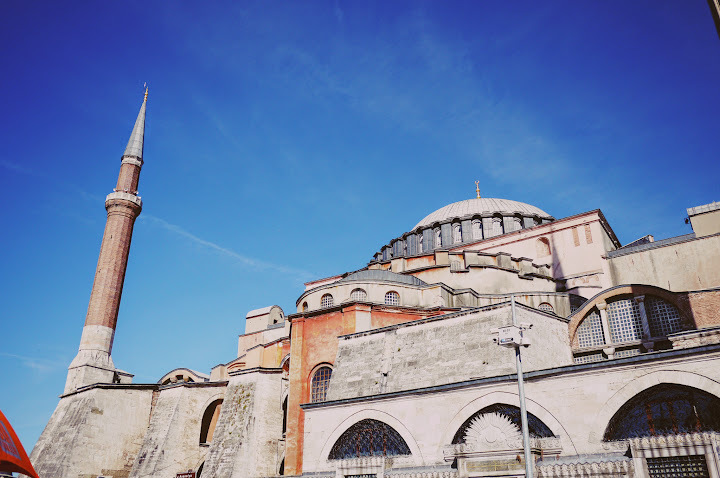 Our final stops of the day were at the famed Blue Mosque and the Hagia Sophia. Just a heads up if you ever visit the Blue Mosque: plug your nose in the area where you have to remove your shoes. I actually wanted to throw up from all the stinky feet fumes. Next up: more of our cruise adventures!